The latest trailer for Ant-Man and the Wasp offered us our first look at the film’s villain, Ghost, a terrifying new adversary from the Quantum Realm. So who exactly is this white-clad character who can phase through anything she wants? We learn in the trailer, released on Tuesday, that Hank Pym opened up the Quantum Realm to go searching for his wife, who’s been trapped there for decades. But right around then, Ghost appeared: “That’s when this crazy, creepy ghost who, like, walks through walls and stuff stole your tech,” Michael Peña’s Luis says in the trailer. More accurately, Ghost can “phase” through objects, which is an ability we’ve only seen from Vision so far in the MCU. Ghost uses these abilities to steal Pym’s technology, but it’s not clear what she uses it for. In the trailer, she emits some kind of wave-like energy from her hands that explodes. Ghost uses her phasing powers to slide through a moving vehicle in 'Ant-Man and the Wasp'. Ghost, as played by Hannah John-Kamen in Ant-Man and the Wasp, is a genderbent version of a Marvel Comics villain originally opposed to Iron Man. The character’s gender doesn’t define them, so Reed chose to make Ghost female, perhaps as a more compelling foil to the debut of the Wasp. “The Ghost character could be male, female, anything, so it just seemed more interesting to us [to cast a woman],” Reed said. Some theories wonder if this Ghost will actually be the daughter of Laurence Fishburne’s Bill Foster, continuing the running theme in the Ant-Man movies of father-daughter relationships. Over in the comics, Ghost can phase through objects or engage cloaking to turn invisible, but he can’t do both at the same time. It’s unclear if the MCU Ghost will also be able to cloak herself, but it seems probable. The suit also allowed the comics Ghost some measure of technopathy and the ability to interface directly with technologies which made for some pretty extreme hacking skills. Ghost originated as an Iron Man villain who spent most of his time harassing and hacking business tycoons, especially Tony Stark. He was a bitter engineer who built his own technology, and after going a bit crazy, he used it to carry out his harshly anti-capitalistic endeavors. In the MCU, it looks like Hank Pym is her primary target instead of Tony Stark. 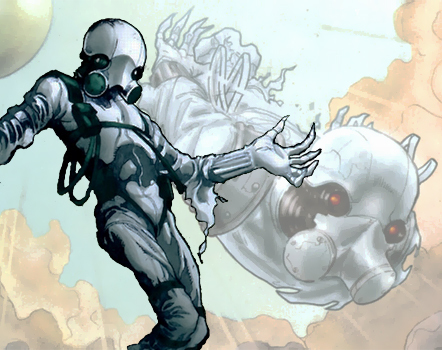 Ghost in Marvel Comics is seriously creepy looking. So far, Ghost’s origins and motives in Ant-Man and the Wasp remain a total mystery, but we’re bound to find out the truth as we get closer to the film’s release. Who is she really working for? How does what happened in Infinity War factor into this story, if at all?